Johann Friedrich Ruhe was responsible for the church music in the Magdeburg cathedral for forty-three years. Yet, almost none of his compositions have survived. 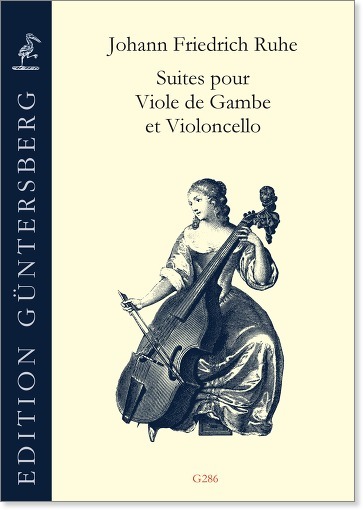 We only know of four sonatas for viola da gamba and Bc, and the present unusual suite whose title unambiguously specifies "pour Viole de Gambe et Violoncello." Accordingly, the work is intended as a duo in which the harmonic filling between the upper and lower voices is consciously dispensed with. In this eight-movement suite written in the French style, the composer oriented himself on the overture style of the great Magdeburg composer Telemann. The suite could have been written in the 1740s, since it displays early Classical characteristics, and is of moderate difficulty. 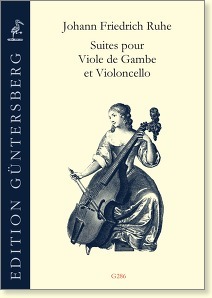 The lower part can also be played on a second (six-string) viol.